The distribution of over 2,000 shoeboxes took over 7 weeks and resulted in 17 Children's Outreach Parties. Enabling us to bring the Salvation message through the Kids EE program. Praise be to God these children are now photographed and documented and are preparing to join the Haiti Child Sponsorship Programme. 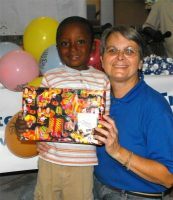 Jenny seen here distributing the Make Jesus Smile shos.ebox gifts to the United Children's Ministry in Bon Repos. United Caribbean began as “Hands of Help” for Barbadian NGO’s and private sector individuals, who responded to the needs of the people of the Tri Island State of Grenada, in the wake of Hurricane Ivan in September 2004. What started as an initiative to render relief assistance quickly grew, following damage assessment and consultation with community leaders, into a strong desire to establish a series of 'Empowerment Programmes' designed to enable the populace especially children to cope with the magnitude of the disaster and help define the scope of the recovery programmes required to restore a Nation. A United Caribbean Trust (UCT) fund was created to oversee the disbursement of donated funds. 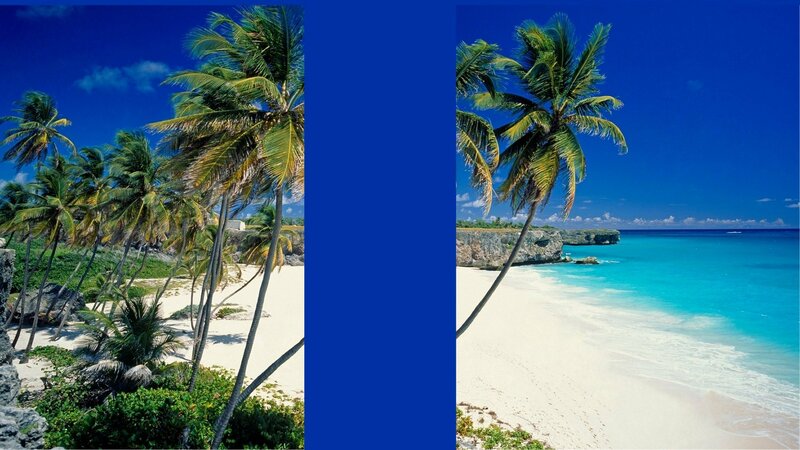 To ensure transparency www.UnitedCaribbean.com was created. God has taken this effort and transformed it into a massive Caribbean Internet Portal showcasing the move of God in our region. UCT is committed to uniting the children of the Caribbean through faith, sports, travel, music, dance and drama. Over the years the ministry has extended into various countries including Haiti, Dominica, Suriname and as far afield as Africa. Click on the picture links opposite to visit these countries. 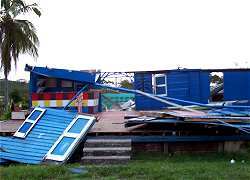 Seen here our church in Carriacou following hurricane Emily. Click to see what God has given us in exchange! 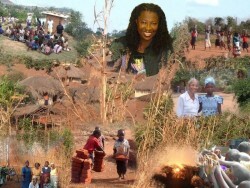 Maureen Bravo is a woman on a mission! Be it “Mission Orlando”, "Mission Florida" or “Mission World”…she is working for unity and praying for the transformation of cities, states, and nations! She serves the Lord joyfully while discipling new believers, mentoring emerging leaders, and training, equipping and preparing those who want to serve together in the Body of Christ. Whether teaching youth, training intercessors, leading worship, facilitating reconciliation, or directing the lost to Christ, Maureen delights in serving the Lord and ministering to His people! Maureen is the Founder / Executive Director of Resources Unlimited International, Inc. and the Founder / Facilitator of the Intercessory Prayer Network of Central Florida (IPNCF) and the extended Intercessory Prayer Network of Florida (IPNFL). Modeling "The Changing Face of Intercession”, Maureen brings together intercessors from across the various streams to pray for their cities (Jeremiah 29:7), and undergird conferences, events and prayer initiatives (ie. Promise Keepers, Exodus International, Mission America, Global Pastors Prayer Conferences, National Marketplace Prayer Summit, Gods Mission, Women of Faith, National Day of Prayer, March for Jesus, the Get Motivated Seminars, Orlando Festival with Luis Palau). This is a major publishing event, as it marks the last major turning point in the tortured odyssey of mankind. The collapse of the ancient world into the misery of the Dark Ages can be blamed mostly on the early church. MEGASHIFT takes a look back at the early and medieval church, from which we are just now escaping, and reveals with surgical precision the deadly flaw that hobbled seventy generations of struggling saints and sent our ancestors reeling through a valley of butchery and hatred. It then opens the curtain on the future, and the arrival of the most breathtaking, sweeping global changes in 2000 years. This book is not about a theory, but a worldwide fact: a megashift now producing documented miracles that stagger belief, the most shocking being the resurrection of hundreds of people in 49 nations, mainly since 1990. A whole new era of humanity is upon us, plus a fresh new phase of Christianity with a dramatically new way of living. Though never disclosed to the general public before, these changes are already clearly destined to eclipse the Reformation and transform the face of civilization. MEGASHIFT breaks the news. It announces a massive power transfer, into the hands of the common man ... and gives us practical ways to take a giant step up, to play a role in this final Transformation, the endgame of the plan of God. Michael and Denie Riggs the Founders of Early Childhood Music a department of Perfect Praise Inc visited Barbados to establish a series of music schools within Pre Primary schools, Nursery Day Care Centres, Sunday Schools and Churches. Research studies indicate that children who study music in their pre-school years have enhanced brain function throughout their lifetime. Founders of Iris Ministries, Inc., an interdenominational mission, in 1980 and have been missionaries for the past twenty-five years. They were both ordained as ministers in 1985 after completing their BA and MA degrees at Southern California College in Biblical Studies and Church Leadership. Rolland is a third-generation missionary born and raised in China and Taiwan. He was greatly influenced by his grandfather, H.A. Baker, who wrote "Visions Beyond the Veil," an account of the extended visions of heaven and hell that children received in his remote orphanage in southwest China two generations ago. •seventh, the strongholds of Satan within ‘The 10/40 Window’. Pastor Happy from Africa leading the way in evangelism and youth outreach in Carriacou.Thy Kingdom Come Deliverance Sanctuary is a beacon of Faith. This young community, struck by two major hurricanes, stepped out in Faith and God showed Himself might. Pastor Happy was given a word from God ten days before hurricane Ivan totally destroyed Grenada, ' There will be a great storm and after the storm a great revival'... watch this space! United Caribbean Trust seeks to establish bases throughout the Caribbean, sold as ‘Christian Timeshare Holiday Resorts’ outside of the hurricane season (thus fund the Trust) and opened to Christian youth groups and Caribbean churches from August to October as conference retreat centres. In the event of a disaster they would become accommodation for relief workers and street evangelist as well as distribution centres.